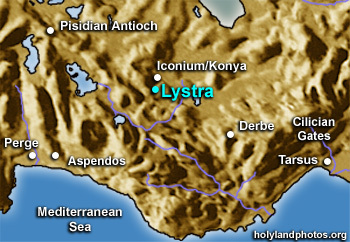 Lystra (mentioned 6 times in the NT) was a city in the district of Lycaonia. It is located on a mound (Zordula Huyuk) just north of the Turkish village of Hatun Saray - about 21 miles [35 km.] south of Konya (ancient Iconium). It is bounded by massive mountains on the west and south, but the highland plains of Anatolia stretch out to the east and north. It was not on a natural thoroughfare, but the Romans made it into a colony in 6 B.C. — probably as an eastern frontier outpost and as a place to help control tribes located in the mountains to the west of Lystra. Eventually, because of its status as a "colony," a road was built connecting Iconium, Lystra, Laranda, Derbe, and Cilicia. Because of its isolated position it was a bit more "provincial" than Iconium or Pisidian Antioch to the north and northwest. Lystra was visited by Paul and Barnabas on their first missionary journey (Acts 14:6, 8, 21). There they healed a crippled man. But when the local population tried to worship them as Hermes and Zeus - with oxen and garlands (Acts 14:11-13) - they refused the honor. At that point, the local population turned on them, stoning Paul and leaving him for dead. But Paul recovered and they headed southeast for Derbe — about 60 miles [100 km.] distant. Lystra was visited by Paul on his second journey and it seems that his beloved companion Timothy was from there (Acts 16:1-5; 2 Tim 3:11) as were Timothy's grandmother Lois and mother Eunice (2 Tim 1:5). Paul probably visited Lystra on his third journey (Acts 18:23). The site of Lystra has not been excavated, but a stone altar, dating to the second century A.D., was found at the site. It is inscribed in Latin and includes the name "Lystra." It is now in the museum in Konya.